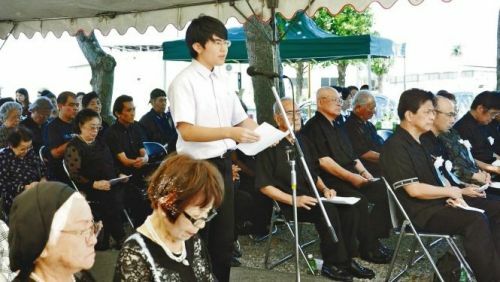 Yuto Kuba read aloud message for peace at the Zuisen Monument Memorial Service. Students from Shuri Girls’ High School were assigned at field hospitals as nurses during the deadly battle. Kuba’s 80-year old grandfather, Satoshige, lost his seven family members including his older sister who was also a student of the school. It is unknown where and when the family members died, so he decided on June 23 as everyone’s death anniversary.